Delhi Dynamos Reserves were held by Delhi United, in the 'Delhi Derby', on Friday at the Ambedkar Stadium, New Delhi in the I-League Second Division. Dynamos came into the game looking for their second win of the season, after three straight losses in previous encounters. Delhi United on the other side, were unbeaten in their last three games, with one win and two draws. Sudipta Malakar, skipped past several defenders at the left flank, and delivered some impressive crosses early in the first half, only for them to be squandered away. Malakar found Manchong from the left who failed to tap it home into an empty net. Dynamos had a freekick swung in. The freekick found debutant Aman who headed it straight to the United custodian, despite being unmarked. Dynamos kept on pressing throughout the game but, United somehow held them on goalless till the final whistle to steal one valuable point. The draw leaves Dynamos with just one win in 5 games so far in Group A.
Delhi Dynamos Reserves will next face FC Pune City Reserves, on April 23 at the same venue, while Delhi United will travel to Srinagar, to play Real Kashmir on April 18. Langsning FC held Mohammedan SC to a 1-1 draw on Friday at the Jawaharlal Nehru Stadium, Shillong in the I-League Second Division. 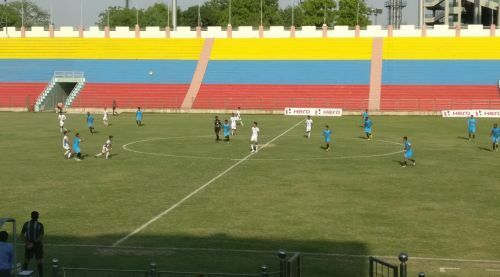 Langsning FC came into this game with eight points from five games, while Mohammedan SC had garnered seven points from four games prior to this match. Mohammedan came tantalisingly close to scoring through Fikru Lemessa, but his shot was saved by the Langsning custodian. Mohammedan shot stopper Subham Roy, was called into action when Fullmoon Mukhim broke to counter, but his shot was saved by Roy. Langsning finally opened the scoring through Stephenson at the half-hour mark. The 'Black Panthers' restored parity in the second half at the 54th-minute mark through Anyichie Celestine. Mohammedan suddenly looked the better side after the equalizer, and kept on pressing for the lead. Langsning kept on absorbing the pressure in the second half until the final whistle and salvaged one point. Langsning FC will next face Chennaiyin FC Reserves, at the SSN College Ground, on April 21, while Mohammedan SC, will travel to Jamshedpur to face Jamshedpur FC Reserves, at the Tata Sports Complex on April 21 as well.